A fantastic starting point for exploration into the world of modular synthesis. A world of sonic and sequencing possibilities. Where it was once fairly common for synth bods to have never laid hands on a modular system, the divide between those who have and those who haven't shrinks daily. As pointed out recently in the excellent documentary I Dream Of Wires: "The Eurorack standard plugged in a whole new group of users... a generation raised on laptops and digital instruments who were looking for something fresh and, ironically, finding it in a form once thought obsolete." So much of the post-NAMM excitement is now shifting to the modular world. We've actually heard that some manufacturers have to remain tight-lipped about what they're planning to release, lest their ideas wind up being ripped off by competitors. As DMX might say, "It's about to get a lot less boutique-y up in here". In the thick of this resurgence is Asheville's Make Noise, which has been releasing modules and systems for the better part of a decade. And with the arrival of their System Cartesian the company has now deliciously lowered the price of entry while continuing to demonstrate why boutique synth modules can be so addictive. Cartesian delivers a variety of synthesis options in one 3U (by 104hp wide) layout that's spread across eight of their top shelf modules. Marrying a couple of powerful sound sources, the system also brings inventive sequencing and full modulation to the package. The STO (as in Sub Timbral Oscillator) module is a full analogue VCO, while Cartesian's other voice, the tELHARMONIC, brings its digital and additive harmonic vibe to the collection. Between the pair, the system has a total of six audio outs that can be patched as the basis for building some fairly complex sounds. The STO and the tELHARMONIC both sport FM inputs so that users can dive into that realm of synthesis as well. Cartesian starts off on the left with the WoggleBug, which can generate random voltages for the purposes of modulating your sounds. "Once you've mastered Rene's logic functions, your adventures with Cartesian are bound to expand." 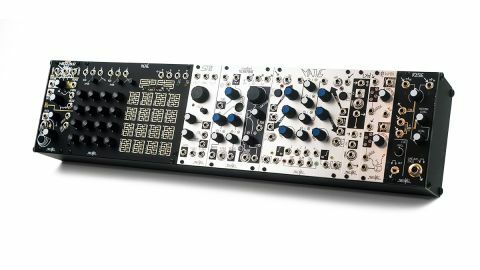 Just 10hp wide, the unit follows on from the Buchla world's Source of Uncertainty module by providing not only stepped and smooth fluctuation but also 'woggle' CVs (a different kind of stepped fluctuation based on the decay of a sine wave). The WoggleBug can also operate as a clock and has a random gate burst output as well. Accompanying the WoggleBug in the Cartesian's modulation scheme is Make Noise's extremely popular MATHS module. So common are the requests for the company to swap it into systems that did not originally feature it, it was a smart move to include MATHS here. Because the module was designed to be useful in a variety of core modular synthesis techniques (lagging, slewing, adding/subtracting voltages, or delaying and changing the width of pulses, etc), it can be a highly educational element to have here in the System Cartesian. In terms of processing, the system sidesteps digital entirely and instead sees the inclusion of the 4hp slim LxD (Low Strike Duo), and its next door neighbour, the modDemix. LxD is the company's analogue 12dB/octave low-pass filter and low-pass gate module, which offers users "simultaneous control over the amplitude and frequency spectrum of an input signal". The modDemix can function as a VCA, ring modulator, and also provide the functionality of a voltage controlled mixer. Lastly, the Rosie handles the output side of the house, allowing your Cartesian to interface with your mixer, headphones or monitoring system. But where the system takes its name from is the Darth Vader black René sequencer module that uses Descartes' (that's right... the French philosopher/mathematician) coordinate system to create inventive patterns. Each of its 16 steps are denoted by the 4x4 knob grid which uses amber LEDs to denote when a 'location' (vice 'step') is reached. By accepting separate clock inputs for the X- and Y-axis, which generate a number from 0 to 3, René derives a specific coordinate for the sound to be mapped to. The associated 4x4 gold touch grid lets the user play the René in real time, stopping/holding a sequence at a particular note or regenerating the pattern's starting point altogether. It's a mind-bogglingly deep way to approach sequencing, especially when trying to break up the doldrums of beat making. Despite what might seem like only a handful of bits to work with, you quickly realise that the System Cartesian opens up tons of sound and sequencing options. The case comes already outfitted with a power supply, which is fed by the included AC adaptor, and to our ears powered up noiselessly and without any electrical hiccups. Make Noise also includes a healthy array of coloured cables so you can build up a fairly complex patch without feeling the immediate need for more. Using the variable shape (it includes sine and sub outputs as well) out of the STO's triangle core provides a rich set of harmonics to drive some subtractive synthesis options, especially when pushed through the LxD and hitting it with an LFO from the MATHS module. The LxD's 12dB per octave filter has a somewhat gentler slope that's also slightly resonant and is capable of producing some very lovely tones. FM fun can be had by sequencing the STO and the MATHS simultaneously. But if you're looking to maintain the FM ratios of a sequence, going for the tELHARMONIC might be the preferred option. When using one of the three sources from the STO patched directly into the FM In of its digital neighbour, you'll find that non-linearities of those analogue outs can give the resulting signal a bit more of an unpredictable edge to it, unlike something you'd hear from a software instrument with a similar routing. If you're just trying to create percussive sounds that are rich in harmonics then the MATHS and STO combo is a good FM solution. During our all too brief visit with the System Cartesian we encountered no discernible stability issues with any of its modules. Make Noise doesn't produce a MIDI to CV converter of its own but, despite having no external controllers or additional effects processors, we had no trouble losing ourselves for hours as we plumbed the depths of its sonic potential. There does't appear to be any patch sheets for the system on the Make Noise site, but we believe they're forthcoming since there are PDF templates for the company's other set-ups already available. But even then we weren't sure if we were 100% clear on how we'd come up with the sound we ended up chasing. Because, in a sense, even if you don't have a complete grip on what you're up to at a certain moment, the sound you're hearing/feeling will absolutely let you know you're right.